Last week I was given a basket of apples by some friends. My kids love to eat them as snacks, but I've been trying to incorporate them into our meals since there are just too many to eat before they start going bad. This weekend, I was home alone with the kids, and since cooking while rounding up a five year old and an 18 month old can be dangerous, I decided to go simple with a salad. It was a beautiful fall day...probably one of the last that a salad would be satisfying as a supper. I came up with this salad with a chicken breast and leftovers in my fridge--the best kinds of meals in my opinion! 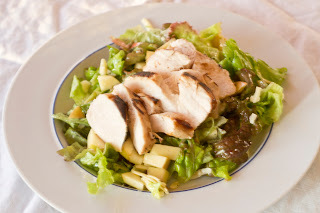 Feel free to add other goodies into the salad, but for this version, I kept it simple with lettuce, apples, gruyère cheese and chicken. In a large ziploc bag or in a shallow dish, combine the apple cider, dijon mustard, red wine vinegar, garlic salt, thyme and olive oil until completely incorporated. Add the chicken breast(s) and completely coat with the marinade. Place in refrigerator for at least two hours, but up to overnight, turning the breasts a couple of times to marinate well. Heat your oven to 350 degrees F. Heat an oven-proof skillet over medium-high heat and spray the skillet lightly with oil. Add the chicken breasts and brown on both sides. When the chicken is browned, cover the skillet lightly with foil and place in the oven for about 5-10 minutes (depending on the size of the chicken breasts), or until the breast is done and reaches an internal temperature of 165 degrees F. When the chicken is done, remove from the oven and place the chicken on a cutting board to rest and cool for at least 10 minutes. While the chicken is cooling, combine the lettuce, apples and cheese in a large bowl. Make the dressing by whisking the mustard, honey, salt, pepper, apple cider and red wine vinegar until they are completely combined. Drizzle the olive oil slowly while whisking. Taste. If it's not sweet enough for you, add a little more honey. If it's not tart enough for you, add a little more red wine vinegar. If it's too tart, add a little more olive oil. The flavoring on this dressing is up to you! Toss the salad with the salad dressing until it is lightly coated, reserving a little dressing to drizzle over the completed salad. Split the salad between the plates. Slice the chicken and lay it nicely on each salad. Drizzle with a little more salad dressing. Serve immediately. Our weather here has been insanely gorgeous hasn't it? This salad looks perfect. I'm going to try the apple cider vinaigrette.